One of the most common questions we get anymore is about The Equipter. This innovative piece of equipment is literally changing the way roofing contractors are able to conduct business and take care of the needs of their customers. Above all else, it has made working conditions better for those who work in this field. In other words, it’s a win-win, for both the roofing contractors and the customers. If you are a Stevens Point homeowner, ready to get your roof replaced, you should know more about The Equipter and your local company that relies on it to get roofing service work completed in a prompt and professional manner. We have one of these for each of our installation crews, in order to make the job more efficient and, most importantly, safer. It comes as no surprise that roofing is far from the easiest job around. Aside from grueling and tiring, it can be quite dangerous. Any advancements possible to help make the job easier and safer are welcome ones. The Equipter will help to make roofing companies work both smarter and safer. If you are not yet familiar with this important piece of equipment, it is a hydraulic dump trailer that is self-propelled. The Equipter has already helped to eliminate some of the factors that can result in roofing injuries, as well as reduced the likelihood of other types of incidents occurring in the first place. Overall, this has helped make the industry safer. One of the ways The Equipter has improved work place safety for roofing contractors is by reducing the likelihood of injuries resulting from falling debris. Since the materials from a roof replacement are no longer simply discarded over the edge of the roof, it means no need for falling debris. This invention is making the outdated method of removing old materials from the roof by pushing them over the edge to the ground, a thing of the past. This approach also makes it easier for crews to cut down on the amount of hands-on material handling required. Since The Equipter can also haul materials up to the roof, as opposed to just bringing down the trash, it means less opportunity for injury related to the task. It is much easier and safer to transport materials, like shingles, to the rooftop by letting machinery do it for you. There are a great number of injuries that are the direct result of hauling away roofing material debris, as well. Pulled muscles, back strains and more, are all possible from the old fashioned method of physically dragging the debris away. It even makes conditions safer for anyone working on the roof and pushing the debris out of the way. It took more effort to push materials from the roof to the ground, and forced roofers to get much closer to the edge, without anything to catch them, should they fall. Having a bucket that can be moved and re-positioned changes all of that. 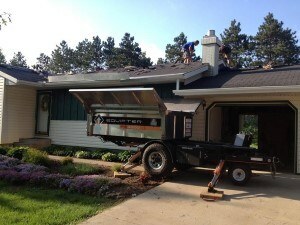 At Oakwood Exteriors, LLC we are proud to be able to offer our New Roof No Mess service. Did you know that, on average, an asphalt roofing replacement project can produce over 10k lbs. of debris? When handled in a traditional and outdated manner, this means a lot of debris littering your lawn while the project is being completed. What’s worse is that many companies are not as diligent about the final cleanup as they should be, which leaves the homeowner cleaning up roofing nails and shingle remnants for weeks to come. By making the wise choice to work with a roofing company that cares enough to use The Equipter, you can feel confident that you are going to love the final results of your project. Not only is the work we do safer and cleaner, it is more effective. This enables us to complete the same job in about 20% less time. Get in touch with us today to find out more or go ahead and get started on your new roof.